The art of the 3rd-9th century Classic Maya was filled with renderings of sacred flowers and revered animals. Jaguars, spider monkeys, poisonous toads, deadly snakes and diverse birds are pictured on stone sculptures, murals, ceramics, jade and shells. The flora most commonly depicted are the water lily and various trees such as Pachira aquatica, related to the world tree (ceiba). I have worked on the iconography and cosmology of the water lily (Nymphaea ampla) in my Ph.D. dissertation, Monsters and Men in Maya Art. I am working with botanist Charles Zidar (Missouri Botanical Garden) on identifying other flowers and plants presented as effigy containers by the Maya. For the last five years I have directed a small Mayan ethno-botanical garden surrounding my house. I have been visiting Guatemala almost every year since age 17 (1963), having spent an entire 12-month season excavating at Tikal (1965) while a student at Harvard, and having spent five years developing the Yaxha-Sacnab parque nacional in the 1970s that subsequently was turned into a much larger park by interested Guatemalan archaeologists, ecologists and government entities, I have some experience with flora and fauna, though my background is in art history, archaeology and anthropology. 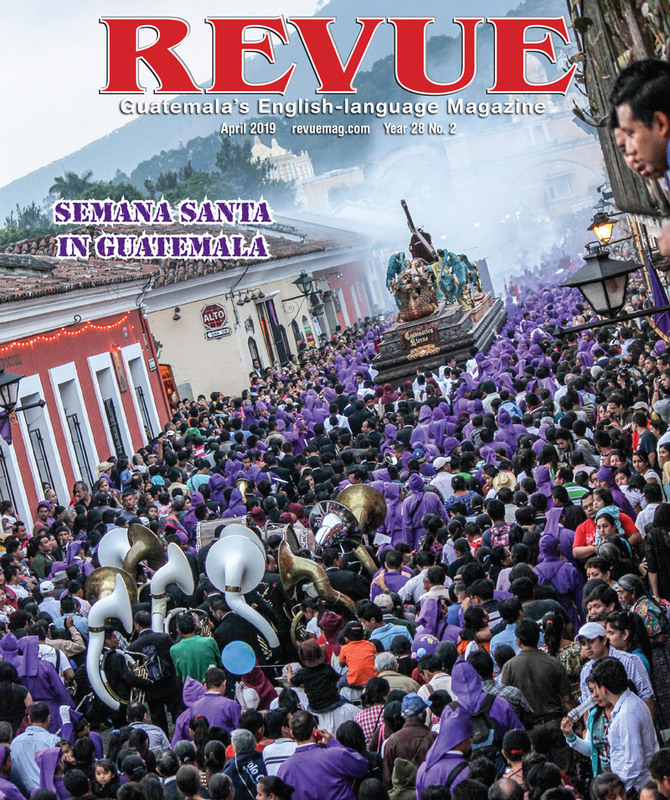 During these decades I have come to enjoy reading the REVUE magazine. 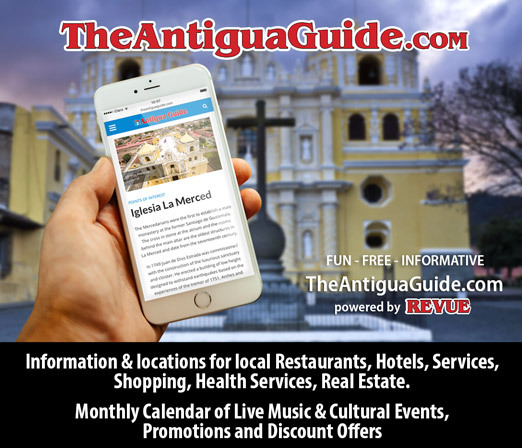 For years I have thought I should write an article every month because plants and animals are of considerable interest to a broad segment of Guatemala’s population as well as to visitors. Plus, we like to encourage eco-friendly research and help protect endangered species and threatened nature reserves. Peccary were included in my Ph.D. dissertation 25 years ago and I recently spent two more days face-to-face with over 50 white-lipped and a dozen white-collared peccary at AutoSafari Chapín. Thus logically peccary will be featured first on our www.maya-archaeology.org and subsequently in my upcoming photo exhibits. 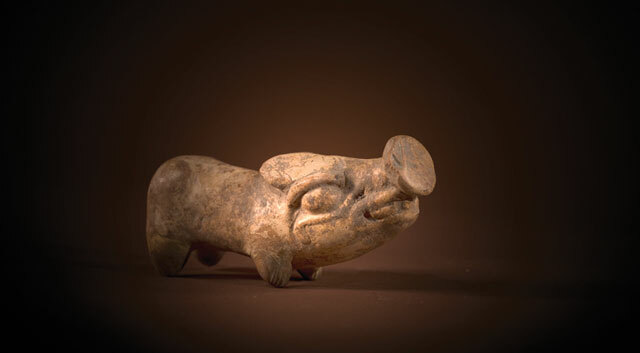 The final factor is that Maya portraits of cosmological peccary are increasingly found by archaeologists, such as the important find at El Zotz by Stephen Houston and co-directors Ernesto Arredondo Leiva and Edwin Román. White-lipped peccary, Tayassu pecari, which is very aggressive and dangerous. Collared peccary, Tayassu tajacu, not as nasty nor as large. Actually, the collared peccary is known to make an excellent pet, though the fangs and tusks of an adult white-lipped peccary can tear your leg apart down to the inner bone. 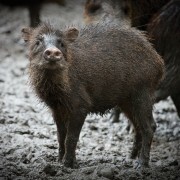 Pecari, or coche de monte, is a common name for the white-lipped peccary. 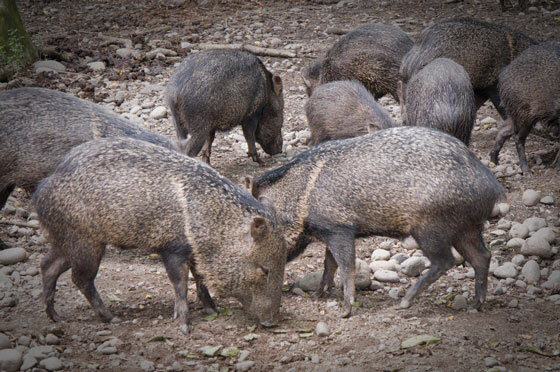 Confusingly the same name, coche de monte, may be used in Guatemala for the collared peccary. Both species of peccary are edible, though I vaguely remember from my jungle diet 35 years ago that one species was definitely nowhere near as tasty as the other. Today I prefer to photograph peccary; it is not appropriate to eat an endangered species. In Yucatec Mayan language, the word for peccary is the same as the word for some turtles, ak. In the Bonampak murals the peccary are near turtles; both are considered constellations. Scholars traditionally associate peccary with Gemini but Roeling notes that the peccary is related to Orion among the Lacandon Maya of Chiapas. Peccary heads as tetrapod supports appear in the same Early Classic centuries (3rd-5th century) as do turtles and water birds catching fish. Since turtles are part of the Underwaterworld cosmology, and since the word for peccary is a pun on the word for turtle, it is not surprising that both are found in similar contexts in royal tombs. Peccary associated with Early Classic basal flange bowls or tetrapods are found in Petén, Belize, Campeche, Quintana Roo and potentially traded into neighboring Yucatán or Tabasco. Indeed, the most ornate peccary tetrapod head found so far is reportedly from Tabasco (Brooklyn Museum). In the Mayan mythic epic history of the Popol Vuh, the “Great White Peccary” was one of the early deities. 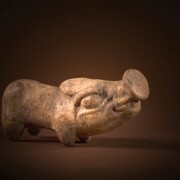 In the Late Classic period (AD 600-850) the peccary is pictured on vases or other art associated with God D or with deer, monkeys, or sometimes with jaguars. I would estimate that the larger, more vicious white-lipped peccary is pictured more than the collared peccary. The Mayan word ak is also used for a dwarf. Dwarfs were kept in the royal courts and were often pictured together with rulers or deity impersonators who were dressed as the Holmul Dancer version of an idealized young noble. But the main punning for peccary is with turtle and constellations. 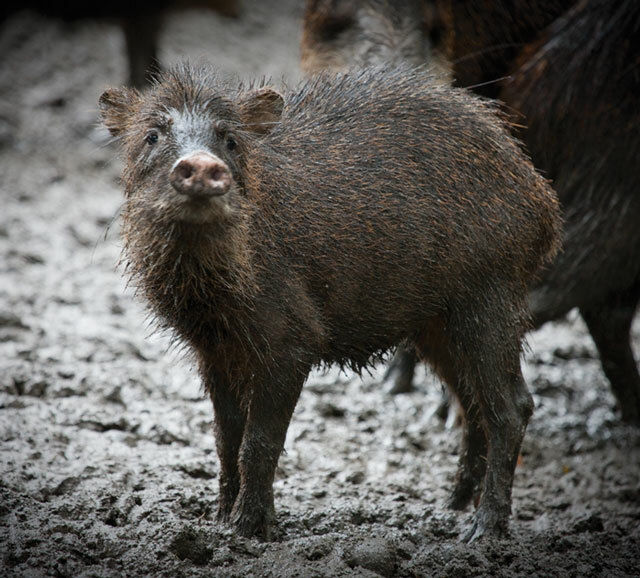 Peccary are noble animals, are revered as patrons of constellations in astrology, and are deemed of sufficient value so as to be featured in royal burials of the rulers of Early Classic Mayan kingdoms. Baby peccary are also cute little mascots. Indeed people who have had them say the main complaint is that a tame peccary will constantly follow up directly under your feet, and will beg for attention and to be scratched day and night (with constant grunting of pleasure when scratched on the belly, or of displeasure when you are not paying due attention to it). I hope you have enjoyed this introduction of animals of importance to the Mayan symbolism, iconography, cosmology and archaeology. Every month I will bring the results of my many decades of studying the achievements of Mayan civilization, especially the remarkable works of art produced by Maya artists of a thousand years ago. Let us hope that we can respect the natural environment and protect both endangered species as well as endangered archaeological sites. If you wish to see peccary tetrapod supports in more detail, I still have a few leather-bound copies of the coffee table edition, published in Graz, Austria, of my Ph.D. dissertation available for benefactors. Plus the text is available in English, Spanish and German. We appreciate the cooperation of Zoológico La Aurora, AutoSafari Chapín, photographer Ricardo Mata, as well as entities mentioned in the article itself.